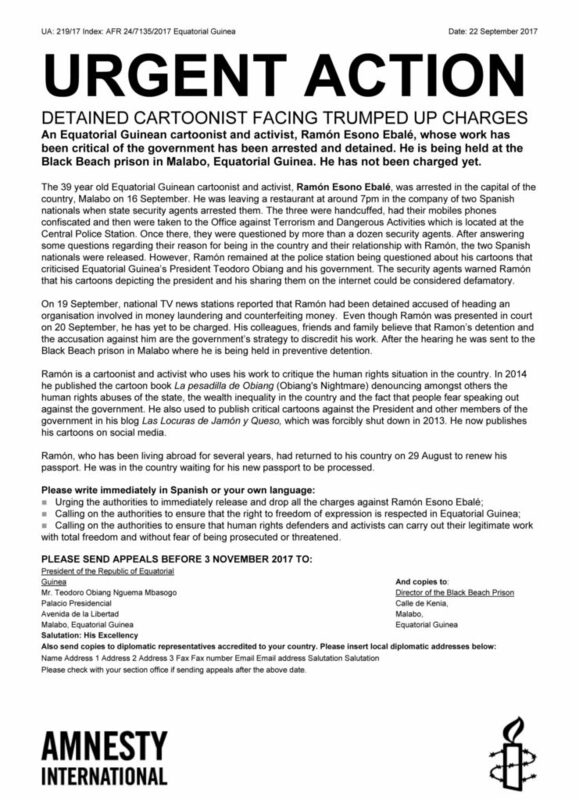 CRNI joins Amnesty International and CPJ in urging the immediate release of Ramon Ebalé, known by his pen name Jamon y Queso. 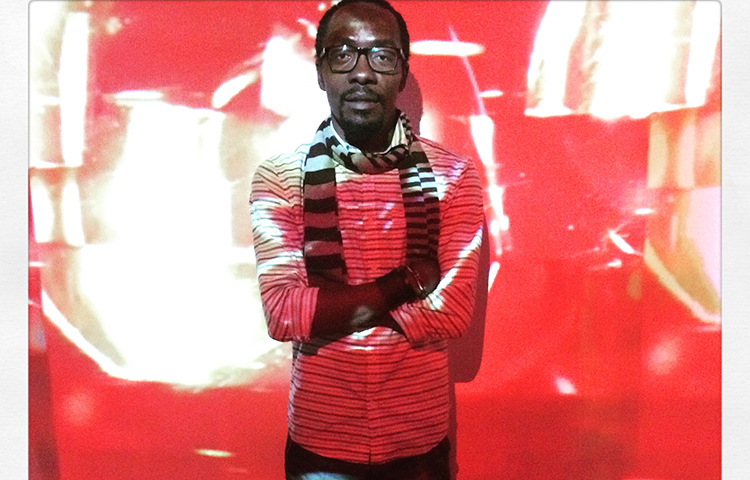 He is being held at the Black Beach Prison in Malabo, Equatorial Guinea. 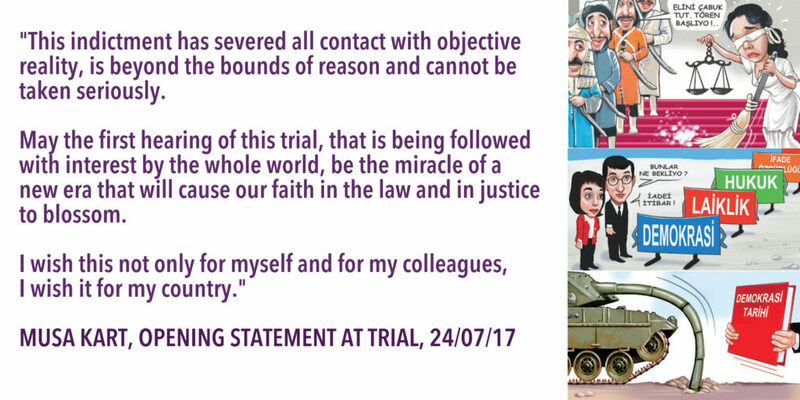 Zunar, the Malaysian cartoonist accused of sedition and living under a travel ban, has announced he is suing his persecutors. We reported about the arrest and confiscation of books at the time. Zunar’s troubles have continued through the intervening months. Just a few weeks ago he cancelled another public event after receiving threats from government supporters. He was the recipient of our Courage in Editorial Cartooning Award in 2011 and the 2016 Cartooning For Peace award. 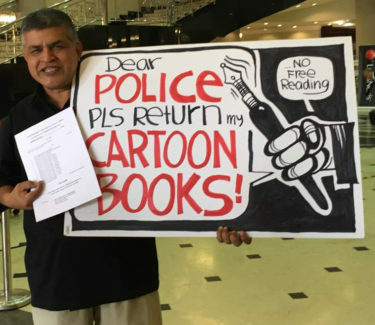 Malaysian cartoonist Zunar reports that a public exhibition of his work has been threatened, not for the first time, with politically-motivated disruption. With a heavy heart, I hereby announce the cancellation of my cartoon exhibition in Penang tommorow (30th July) because of threat from a group of troublemakers. Penang is at northern part of Malaysia, about 4 hour drive of Kuala Lumpur. The exhibition entitled KETAWA PINK PINK scheduled to take place at an open space at Beach Street in George Town from 8 am to 12 noon. Penang Umno Youth (Prime Minister Youth Party) has distributed poster urging their members to come and ‘visit’ my exhibition. Based on last year’s experience, this is not a normal visit, but more of an act of physical intimidation. They can become very rowdy and aggressive, as seen at my exhibition venue in Komtar last November. Also as per last year, there is no guarantee that the police would take any action to stop them. So, I have no choice but to call off the exhibition due to security reasons. 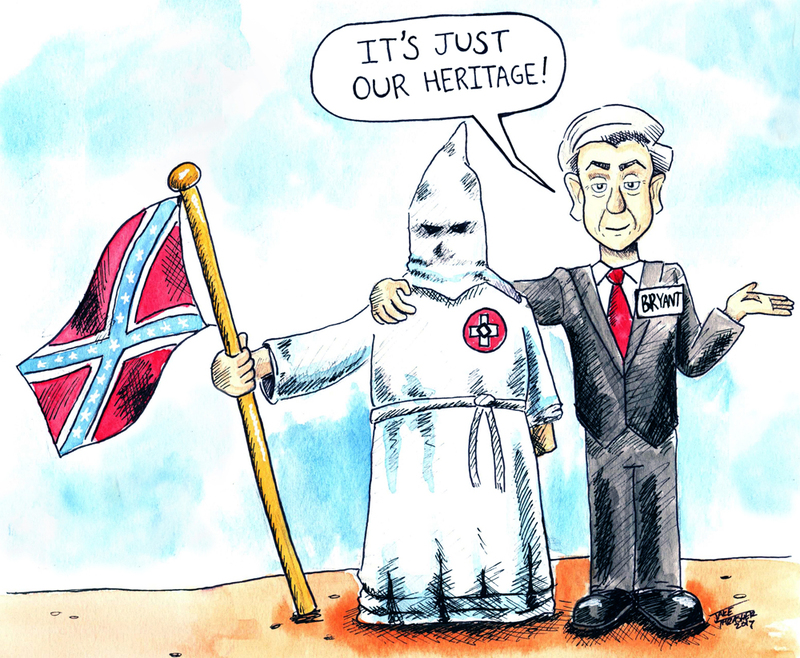 Nevertheless, this will not stop me from disseminating messages of anti corruption through my cartoons. KETAWA PINK PINK will be turned into another cartoon book very soon. It covers topics such as 1MDB scandal, DOJ exposures and the purchase of the Pink Diamond, worth hundreds of millions of dollars. I am also mooting an idea to make it digital open source; this means that it will be made free for the people to download and distribute the book themselves, providing I get the sponsor for the initial print. I am facing a prison sentence of almost twenty-nine years. What is more, we also know that the prosecutor who is making these allegations is being tried on the grounds of ‘Being a member of the Fettullah Gülen organisation and of attempting a coup’. Yes, I am being tried on the grounds of ‘Serving a terrorist organisation to its benefit by way of one’s actions, whilst not being a member of a terrorist organisation and not committing a crime in the name of a terrorist organisation’! Years ago, I drew some cartoons drawing attention to the fact that Fettullah Gülen was developing an organisation within the state. How tragic it is, and also how comic that I am being tried today by the testimony of people who were at Gülen’s right hand. Yes, I have had the privilege of being Cumhuriyet newspaper’s cartoonist for twenty-three years. If some unprejudiced research had been conducted in this case it would have been seen that my signature is there, under the most scathing cartoons of terrorist organisations, primarily those of FETÖ. And the fact that these anti-terrorist cartoons have appeared on the front page for the last six years is further proof that my paper should not be held up as being aligned with a terrorist organisation. One of the terms he used to describe manipulation was ‘to veil the truth’. • Our newspaper has ‘so to speak’ been taken over by the armed terrorist organisation FETÖ/PDY, our newspaper had ‘so to speak’ defended a terrorist organisation and had ‘so to speak’ been its protector. There is no concrete evidence here at all, no membership of a terrorist organisation, but there is, ‘so to speak’, a terrorist organisation and this organisation has committed ‘so to speak’ crimes. • If this is the case, we have been locked up ‘so to speak’ in Silivri for nine months! • Whilst I had been hoping to spend three days in a room with a sea view in Bodrum, I ended up spending nine months in a cell with a concrete view in Silivri. I don’t think that my experiences can be passed off as a mere reservation blunder! This indictment has severed all contact with objective reality, is beyond the bounds of reason and cannot be taken seriously. It is frowned upon even by all those people who are not encumbered with a heart and a brain. It’s lost face even with them! You will appreciate of course, that I could have made my own jokes about this indictment, but I didn’t. This is because good-mannered humourists know only too well, you don’t hit a man when he’s down! 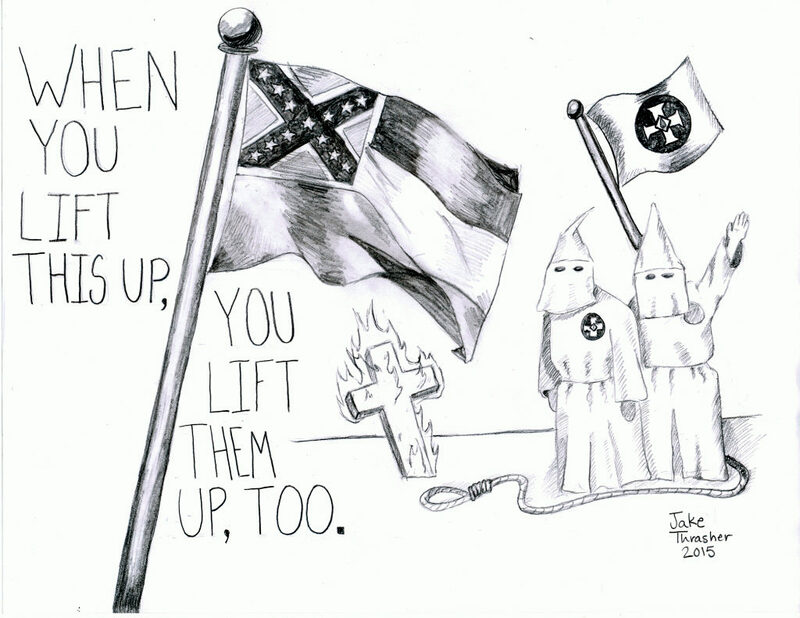 Can you make a cartoonist confess? Let’s see! Yes, in my life as a cartoonist I have aided and abetted only one organisation. And the name of this organisation is the ACC. Which is an acronym for All my Country’s Children. Among the members is my granddaughter, who is two-and-a-half. I know for a fact that children of the members of your board and children of all of our friends who are present in the courtroom here today are among the members of this organisation. ‘So, will you make me a member of your organisation too?’ I asked. There you have it, my confession. The truth of the matter is, aiding and abetting this children’s organisation has been the meaning of my life. Instead of the threat of punishment, I have always feared being an embarrassment to our children! As you will know, in 2016, Turkey was in ninety-ninth position out of one hundred and thirteen countries in the index on the rule of law. And we can all see that the situation is getting even worse in 2017. In all of the debates on justice there is no-one left saying ‘There is Justice in this Country.’ What we need to be able to live together is common ground and common justice! When our homes were searched with a fine-toothed comb, no safes full of money were found nor shoe boxes stuffed with dollars! The Financial Crimes Investigation Board and the Savings Deposit Insurance Fund examined the bank accounts and movement of monies of ourselves and our family members. But they did not find evidence of one penny’s worth of irregularity. 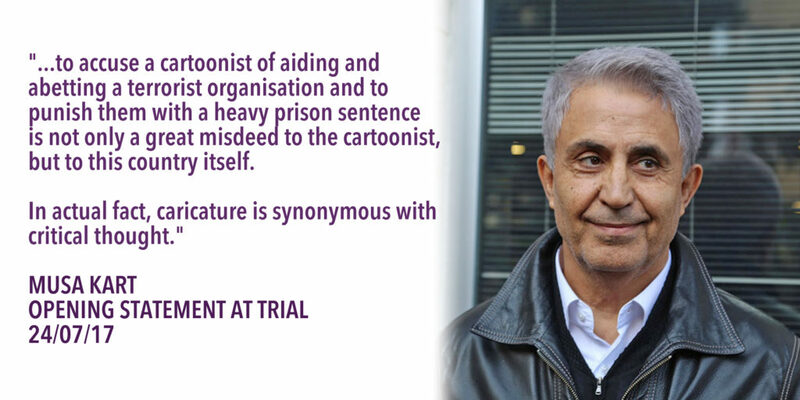 Many more of the world’s cartoonists have responded in solidarity with their colleague. 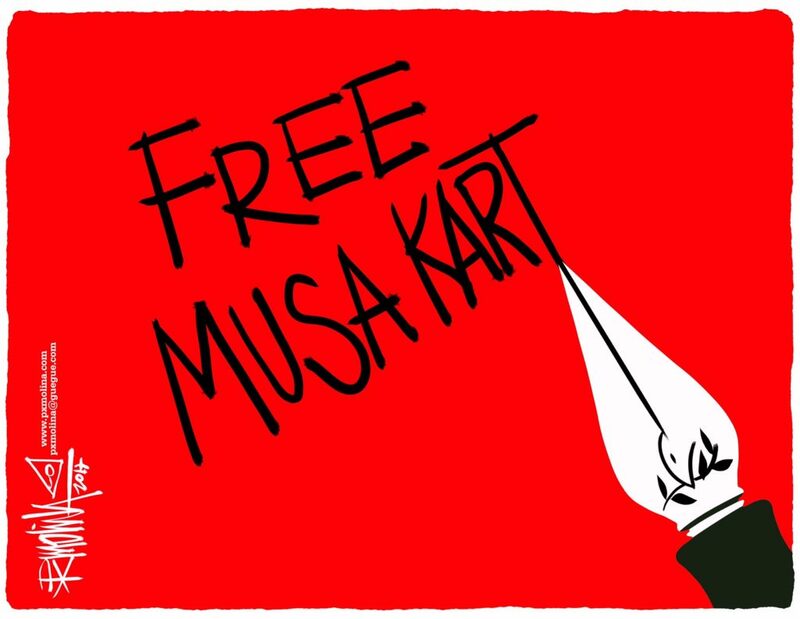 We join them in urging Turkey to release Musa Kart immediately.